Holy Virgin of Virgins . 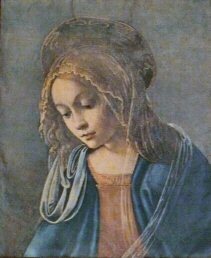 . .
Mary had chosen to live as a virgin. This was seen, when in her early teens, she responded to the angel's greeting that she would bear a son whom she would call Jesus. Her life was dedicated to giving herself entirely to God. Human love expressed through conjugal love was not chosen and was over-shadowed as she freely offered her entire love to her creator. Her response, "I do not know man," (Luke 1:34), signals her modest and chaste attitude toward her chosen life and the future as announced by the angel. 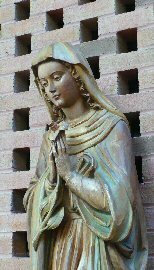 Her sinless nature and the singular privilege of becoming the mother of God's Son, granted to her by her creator, lifted Mary's pure virginity to the highest level of humanity next to that of divinity. She is the perfect example of human cooperation with God's love. 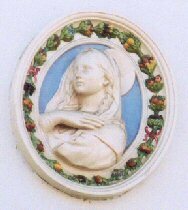 "Behold, I am the handmaid of the Lord. 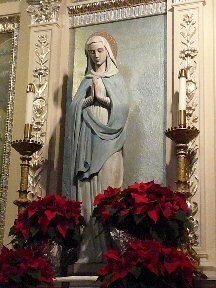 May it be done to me according to your word" (cf.1:38), was not only Mary's perfect fiat to God's request, but a model for all who dedicate their love and life to God by imitating her virginity.